Waterfalls are a unique blend of rushing water, rock structures and trees. The most common trees found near waterfalls are pine and cedar trees. Most notably in Northern Ontario. You can find pockets of broad leaf trees such as Maple, Oak, Poplar and Birch. In the Fall broad leaf trees can add a dash of color to your composition as shown above. The height of a waterfalls can vary as to location. The color of the rocks are different from location to location. At this particular waterfalls the rock formation is basically black to grey. Other waterfalls you will fine granite that is a reddish color. By photographing in the Fall you can offset bland rock color with orange and red from the Fall leaf color. This particular shot was taken late evening to eliminate harsh lighting. Take a look at the Pine in the upper part of photo that partially overhangs the waterfalls. You will notice the beam of light catching some of the branches. You can pick up sunlight on the upper part of the falls. This adds a nice touch to the composition. By putting the red Maple on the right hand side of the photo, I am able to create some depth. 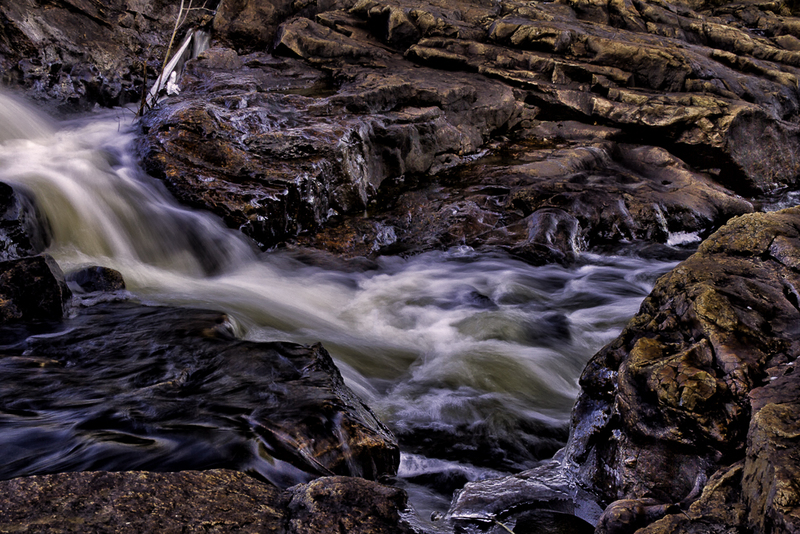 I try to shoot waterfalls at an angle to give more of a dimensional look as appose to shooting direct on. Shooting a waterfalls dead on will give you a more flat look. Now for the flowing water. You want to give the water life in your photo. By shooting later in the evening you also achieve lower shutter speeds. When processing the work you want to be able to bring detail to the water. Give it life and action. I accomplish this by setting my shutter speed between 1/10, 1/8, 1/6, 1/4 range. Whatever works at the time. Remember as the evening wears on the light becomes less and less. My f- stop is constant at f22. A good tripod is a must, along with a polarizing filter. One other point is that the volume of water coming over the drop. If their is too much water, most of the rock structure will be underwater. Totally different affect. Myself I prefer as much exposed rock as possible. That means that I pick my times to go during the course of the year. Well that is it for now. Until next time happy trails. This composition was taken on my last trip into Grundy Provincial Park. Maureen and I had walked in from the main gate. The hike to Clear Lake that afternoon was very enjoyable. The temperature was warm enough to be comfortable. Clear Lake had ice forming on the surface here and there. The above location was the South shoreline of Clear Lake. The rock structure along here was unique for its patterns. The vegetation was a rustic color. The ice had patterns. The ice in the foreground had blue reflection from the sky. The gallery received 399 entries from 13 different countries from around the world, including Australia, Canada, France, Hungary, India, Italy, Ireland, Kazakhstan, Netherlands, New Zealand, Spain, Switzerland, United Kingdom and Ukraine. In addition, the gallery received entries from 31 different states. Overall Winning Artists Category – The overall winning artist’s category consists of the 10 Best Entries received from the Painting & Other and Photography & Digital categories. Happy New Year to everyone. Until next time happy trails. Jan Winther and I crossed over from the Westbranch to the Tote Road North of Massey.We came on to the Massey Tote Road at the 28 mile mark.It was early afternoon as we headed South.This is a very windy and hilly road for many kilometers. Jan loves photographing waterfalls, so I figured we would check out Cameron Falls on the Aux Sauble River. I had hiked into this falls last June.I was very much disappointed when I had arrived.There was no water going over the falls at all.What a disapointment. So with that in mind we walked into the Cameron Falls.Upon arrival we saw a fair amount of water to make it possible to get some photos.The water level was still low from previous years.Jan was sure happy though so I left him to his thing and started exploring.I have been here many times, but am always fasinated by the unique rock structure found here.There is black rock and red granite rock.Due to the running water over time has reshaped many of the rocks surfaces. I love doing close up compositions of running water and rocks.The above photo is a typical example.By using various shutter speeds and f22 I am looking for character in the water flow.I want detail in the water and colour.Now color is obtained late in the evening as while as the rocks lose their harshness due to the bright sunlight most of the day.I also found from expierience that clear blue skys with give better effects.You will notice the water at bottom left of photo is a dark blue. This created by clear blue skys above the water. We stayed as late as we could.But had to get out with enough light to see.I always carry a couple small flashlights in case I get carried away photographing and let the darkness creep up. That is it for this week.So thanks for coming to visitThe tea is always on.So until next time happy trails. 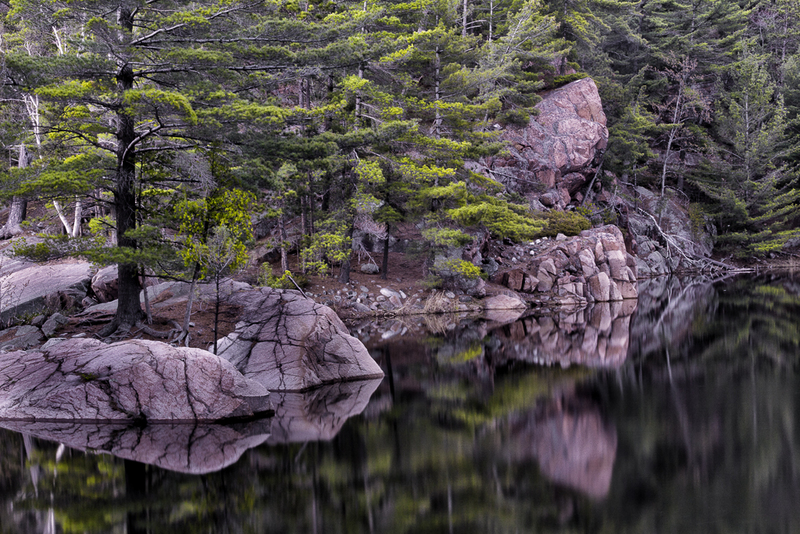 One of my favorite pastimes is hiking along lake shores looking for interesting rock patterns to create a photographic composition.More so if the rock structures are unique.I came across these unique rocks in a small back bay on a small lake in Killarney Provincial Park.The rocks are a reddish granite material.The rocks in the foreground had very interesting lines streaking the surface,adding a nice touch.Also there was a nice pine tree growing in the middle of the rocks with some interesting color effects.the reflection of the foreground rocks was perfect.Now in the background was another interesting granite rock formation that was of a different nature.I had a bit of a problem in that area with the wind so that a good reflection was not possible.By combing the two elements I was able to come up with the above photo.The photo was also taken late evening to get the nice soft lighting. Turner Point is located on George Lake in the main campgrounds at Killarney Provincial Park,Northern Ontario. In the background is Hawk’s Ridge.The rock structure around many areas of the shoreline consists of reddish granite rock.The La Cloche Mountains are in the background are composed of white Quartz rock covered with trees.In this instance fall colors. This was a heavy overcast day. The rain had just eased off from a heavy downpour.There was a fair bit of fog this morning and I had already taken a number of shots.For a while the fog was so thick you could not see anything.I knew there was some color in the background and I had to be patient.It was still early in the Fall for full color.As I waited the fog begun to lift and slowly the mountains became clear and when the splash of colors showed up is when I began shooting.I created this composition with two photos taken that day. While that is it for this week.In my part of the country it is a holiday called Family Day.It is nice when all families can get together.So until next time happy trails.